. :: THUNDER SNOW WINS AN INCREDIBLE CONSECUTIVE US$12 DUBAI WORLD CUP ::. 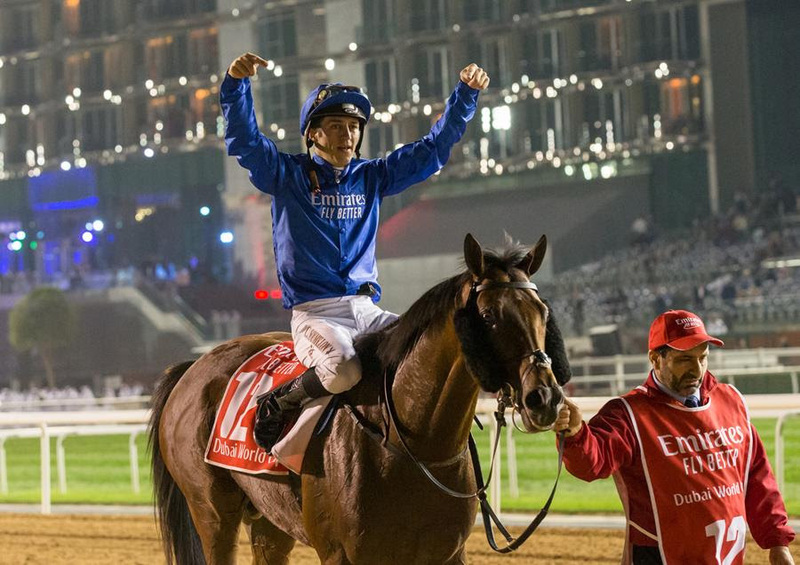 Thunder Snow overcame a huge amount of difficulty to become the first horse in history to land consecutive wins in the US$12 million Dubai World Cup sponsored by Emirates Airline (G1). Thunder Snow was again drawn wide in the 2000m feature and soon adopted a prominent position, but he had to find extraordinary reserves in the run to the line to overhaul Gronkowski by a nose. The latter had chased the pace with North America, who weakened into the field, with American challenger Gunnevera coming through late to be beaten two and three-quarter lengths into third. The 5-year-old defied the widest stall bar one to score and was providing trainer Saeed bin Suroor with a remarkable ninth win in the Dubai World Cup in a winning time of 2 minutes 3.87 seconds. The son of Helmet has now won eight of his 23 career starts with a prize money total of US$16,011,850. Christophe Soumillon, Jockey, THUNDER SNOW (1st)—“Last year I won by five,six, even more lengths, and today Thunder had to fight hard. I really want to say a big thank you to Saeed bin Suroor, and also to HH Sheikh Mohammed, just before the race they said to me in the paddock you should have so much confidence and do everything right. Thanks to Thunder Snow, because without him I would not be able to do such things.